Four years ago, Srikanth Nammalwar Kidambi was in the ICU of a Hyderabad hospital when he collapsed in the bathroom after a strenuous training session. At the end of that dreaded July in 2014, when he was diagnosed with meningitis, he was ranked world No. 29. Today he is the world’s No. 1 badminton player. Could anything at all have foretold this total inversion of fate? Yes, Srikanth’s incredible work ethic and willingness to push himself to the very limits. If rankings could tell tales, Srikanth’s would speak of unr­elieved toil. At the just-concluded Commonwealth Games (CWG) in Gold Coast, 25-year-old Srikanth played a key role in providing India a confident platform by helping it win the mixed team gold. Later, the top seed reached the singles final too. He lost to Lee Chong Wei of Malaysia (world No. 1 from 2008-12), but not before wresting the first game. 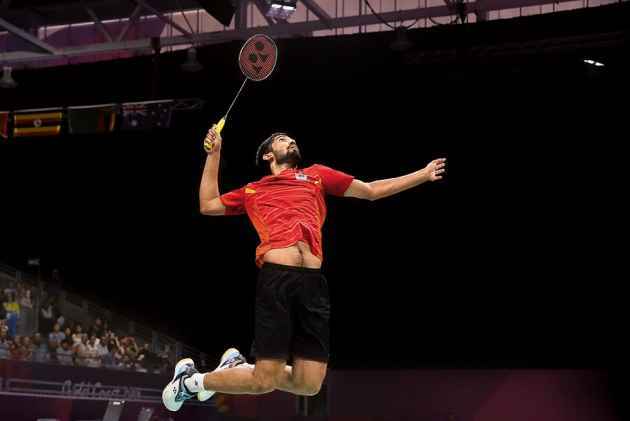 Between the two events, the Badminton World Federation (BWF) announced their latest rankings, charting Srikanth’s climb to the summit, replacing Denmark’s Viktor Axelsen. It was three years since Saina Nehwal had reached the pinnacle in the women’s category in April 2015. Currently, P.V. Sindhu is ranked No. 3 and Saina, who was laid low by a knee injury last year, is 12th. Thanks to the six medals, including two golds the shuttlers won, India finished a creditable third in the CWG medal standings with 66 medals—26 gold, 20 silver and 20 bronze, behind hosts Australia (80 gold) and England (45 gold). It was a shade better than the 2014 CWG in Glasgow, where it had won 64 medals, including 15 gold. The All England, World Championships, Asiad and Olympics crowns still elude Srikanth. Plus, he has to be motivated and fight monotony. Though India has dominated some team sports like cricket and hockey, there have been only a few instances when Indians have reached the peak, with consistent world-class performances in individual competitions. The exceptions are chess wizard Viswa­na­than Anand; ace shuttlers Prakash Padukone and Saina; Leander Paes and Mahesh Bhupathi in doubles and Sania Mirza (with Martina Hingis) in women’s doubles tennis; archer Deepika Kumari; and shooters Jitu Rai, Ronjan Singh Sodhi and Heena Sidhu. Indian women, like Saina, who won the CWG gold beating the 2016 Olympic silver medallist Sindhu, have been performing consistently. And there are now three Indians in the top 15 ranking chart in men’s badminton. Besides leader Srikanth, Prannoy H.S. is at 11th and Sai Praneeth B. at the 15th position. Last November, Srikanth had become world No. 2, inching further up from the No. 4 spot. His climb to the No. 1 spot on April 12 was achieved on the foundation of some fine achievements last year, when he won four major titles—the most by any player in 2017. In the recent past, only Chong Wei has done better—winning five titles each in 2015 and 2016. “This is very special. Indian badminton has a good history and some players have gone on to the top level, right from the 1950s. Nandu Natekar and Dinesh Khanna, and then Prakash Padukone won the All England in 1981. But in the last 10 years, many good players have come along. Saina became No. 1, Jwala Gutta and Ashwani Ponappa, Prannoy H.S., Satwiksairaj Rankireddy, and Chirag Chandrashekhar Shetty—all are playing at the highest level [with distinction],” former national champion U. Vimal Kumar tells Outlook. However, no one beats Srikanth in single-minded devotion and hard work. Slightly built, he is a naturally gifted player. The right-hander has a rich variety of strokes, including a powerful smash—often delivered from the back of the court, and containing a dizzying var­iety of guile and craftiness itself—and deceives his opponents with clever man­oeuverings. He is one of the most attacking players in the world, and prowls the court with lightning speed. His net play, too, is mesmerising. Earlier, when he used to falter while attacking, cracks would appear in his game. Now he plays long rallies and keeps the shuttle in play when the going is tough. That’s a giant leap in tactical range. Srikanth’s journey to the top of a world sport has its origins in obscurity, and his path was strewn with heavy odds. Born to a farmer father, K.V.S. Krishna and homemaker Radha in Ravulapalem, Andhra Pradesh, Srikanth’s elder brother Nanda Gopal was a doubles player. Srikanth also began as a doubles player, before shifting his focus onto singles. “Strategically, Srikanth is very good and so is his net game. The backhand cross-court smash is deadly,” says coach Syed Mohammed Arif. Soon, Srikanth caught the eye of former All England champion Pullela Gopichand, the great coach who runs his celebrated academy in Hyderabad, the nursery of India’s world-class shuttlers. Srikanth joined up in 2009. Renowned coach Bhaskar Babu distinctly remembers the time he met Srikanth in 2010-11, when he was conducting a national camp for core group players in Hyderabad. “I used to take his services, especially for sparring with Saina Nehwal, the only player of world standard at the time. Srikanth had a good attack and used to play a lot of rallies. All that was very useful for Saina; her sparring with Srikanth particularly improved her defence,” recalls Babu. Gopichand’s coach Syed Mohammed Arif, too, has followed Srikanth’s career closely. “In the last few years, he has beaten almost all top players. Speed is his biggest asset and he is very agile on his legs; his movements are brisk. Strategically, he’s very good and so is his net game. The backhand cross-court smash against his right-handed opponent is deadly,” points out the Dronacharya Awardee coach. The way Srikanth beat Chong Wei, currently world No. 7, in the CWG mixed team final—with consummate ease—was an achievement, as he was yet to beat the Malaysian in their four meetings in ranking tournaments. His 21-17, 21-14 win over Chong on April 9 will hopefully give Srikanth a mental edge over him in future encounters. Interestingly, Srikanth has become world No. 1 without winning the World Championships—and the farthest he has reached is the quarter-finals of the All England, the Olympic Games and the Asian Games. He would be desperately keen to add these to his silverware to be regarded as one of the greats. His best at the Olympics was reaching the quarter-finals in 2016 in Rio. Srikanth himself realises that he has to overcome these last hurdles standing before him in his remarkable journey. “I am very happy to become world No. 1, but I want to be more consistent and perform well in every tournament I play,” Srikanth told Outlook from Gold Coast. The first, big obstacle course before Srikanth is the World Championships, to be held in July-August in Nanjing, China. The All England is almost a year away and the Olympics beckons in the distance: 2020. But he will have a crack at the Asian Games in August-September in Jakarta and Palem­bang, Indonesia, where he will face a tough challenge from the Chinese and Japanese shuttlers as well. For that, Srikanth will have to remain fit, maintain form and remain fiercely focused. “When you have a few of the big events, like All England and World Cham­pion­ships under your belt, you will have a lot more satisfaction. Even Saina got to world No. 1, and then lost in the final of the All England and World Cham­pionships [both in 2015]. This year, Srikanth can look at winning the Asian Games and the World Championships, which is a good possibility. I feel he has a good chance there. If he wins those big ones, he can become one of the all-time greats,” says Vimal Kumar. Arvind Bhat, a two-time national singles champion, says Srikanth will have to make sacrifices to achieve his dream. “He would need perseverance. He’ll have to keep his mind and body fresh. He’ll have to work on his weaknesses to go on and win the titles that have eluded him so far, like the World Championships. But I see him winning these titles by 2020,” predicts Bhat optimistically. After becoming No. 1, Srikanth has raised expectations, besides inspiring youngsters to take to badminton. Along with that there would be more distractions—a torrent of adulation, with people vying for a piece of him. So, he will have to be more fiercely focused and work harder than before to remain ahead of his rivals. Arif warns him of the crucial factor of monotony. “A good player continuously keeps working and improving on any one aspect of his game, physically. On the technical side, since your opponents know your game as all matches are video-­recorded, you must have a weapon to surprise them. And there comes a time when monotony creeps in and that leads to downfall. He’ll have to guard against that,” says the Hyderabad-based coach. Srikanth is determined and has rem­arkable will-power in the face of challenges, as he has exhibited. After he was laid low by meningitis in 2014, he not only recovered from the illness in a couple of weeks, but within four months did the unthinkable. He stunned China’s red­o­ubtable Lin Dan—a two-time Oly­mpic champion, five-time world champion, and six-time All England win­­ner—in the final of China Open SuperSeries Premier to become the first Indian to clinch the men’s title. “The illness changed me. I became more passionate than ever. I st­a­rted training a lot harder,” Srikanth had said then. More than any time in his car­eer, his millions of fans would like to see the same kind of results from him. Improving his own track record and drawing amply from Gopichand’s unparalleled technical nous, it will be tough to dislodge Srikanth from his new-found perch.